Entertainment was a big factor and provided everyone with amusement and enjoyment. In addition, many would come from all around to watch their favorite theater movie. On this episode of Design Santa Barbara learn about how producers went about advertising their movies and the evolution of entertainment. For as long as their has been performing arts, their has been a need to advertise it. The first public theaters in England opened in London in 1576. Performances by the first theaters where announced by handbills. Sheets of paper entered in mass quantities for as little money as possible known as handbills. Furthermore, they would feature texts in varies forms to detail their upcoming event. Larger posters where influenced by french theater companies. in conclusion, as printing techniques developed so did the quality of advertising. For instance, color and images where added. For example, names such as Edmin Booth and Sarah Bernhardt packed a theater when they were attached to a shows pamphlet. In the late 1800’s in Paris Henri de Toulouse-Lautrec created some of the most famous posters and prints in the pop culture media. For instance, Moulin Rouge: La Goulue a poster by French artist Henri de Toulouse-Lautrec. It is a color lithograph from 1891, probably printed in about 3,000 copies. Advertising the famous dancers La Goulue and “No-Bones” Valentin, and the new Paris dance hall Moulin Rouge. Though most examples were pasted as advertising posters and lost. Furthermore, Surviving examples are in the collection of the Indianapolis Museum of Art and many other institutions. The rise of broad-way musicals saw advertising with colorful artwork reflecting their energetic shows being sold. As the motion picture expanded so did the artwork used to advertise. 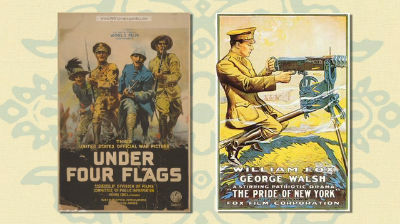 Furthermore, Epic motion pictures like “Gone With The Wind” where advertised with ornate posters featuring vivid colors. In conclusion, Many Artist where commissioned to create grand paintings that would serve as a sweeping image of what the film represents to help fill the auditoriums. As times changed so did the styles of movies. Movie posters today are considered works of art and are proudly displayed in homes. In addition, This way you can easily show guest what taste in films you have. Whether it is in a game room, movie room, man cave, or even just your bedroom. Furthermore, movie posters are a high collectable all over the world. An aspect to movie posters than can increase the value are autographs from the actors and producer in the movie.